As the winter begins to draw in Bass Culture delivers a fresh new release straight from the oven, to keep you warm as the nights get ever colder. The label owned by Paris stalwart D’Julz welcomes back an old friend in Anonym, the man responsible for BCR006 and BCR021 returns for a four-track outing which includes a remix from Orlando Voorn. 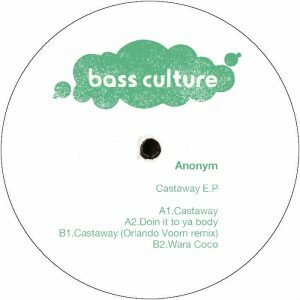 Sultry atmospherics and masterful production are evident throughout this crisp new addition to the Bass Culture catalogue, another instant classic from the Detroit badboy Anonym. The first of the four tracks on this EP goes by the name of ‘Castaway’, and its effortless groove will have you drifting away to a desert island the second you hear it. As a slightly obscured vocal repeats ‘castaway’ over and over, you’re lulled into a dreamlike state. Simple and highly effective, its progression is subtle and invigorating. Right after that we have Dutch supremo Orlando Voorn taking charge of the remix and pushing the track deeper into celestial territory with flashes of synth that transport you out into the cosmos. The atmosphere of the original is expertly retained, with a steady pace and cool, mellow vibes throughout. Flip the record over and there are two more killer cuts. First we have ‘Doin It To Ya Body’, which keeps things minimal and straight to the point. Bright disco strings lie at the heart of this track, slowly weaving their way in and out of the background while the drums and rugged b-line keep your feet moving and head bopping. Lastly, ‘Wara Coco’ offers more hypnotic vibes drawing you with its dainty melody, dancing around the top end, while a mean bassline throbs away, deep down in the low end. It’s an strong combination and finishes off the EP in style. This entry was posted on October 11, 2016 at 23:00 and is filed under Release.